The January 2010 Daring Cooks’ Challenge was hosted by cuppy of cuppylicious. She chose satay. Some of the challenges have been quite, well, challenging, so I was so happy that this recipe did not require lots of exotic ingredients or multiple steps. I made the chicken satay variation, and I learned that the broiler works quite well to cook the skewers inside the house. I was a skeptic, but now I have to change my tune. The skewers were as crispy and moist as if they were cooked on the grill. Mmmm. 1) Use boneless chicken thighs instead of chicken breast. You'll have a noticeable improvement in your skewers, because the thighs stay juicy. 2) Put a strip of foil between the ends of the skewers and the grill, so the ends don't burn off. With the broiler, I folded the foil loosely over the ends of the skewers. It worked great. For the satay recipe and peanut sauce recipe on the Daring Kitchen website, click here. You sure can take very professional photographs and yes the broiler does work almost as well as the BBQ. Superb work on this challeneg. Cheers from Audax in Sydney Australia. 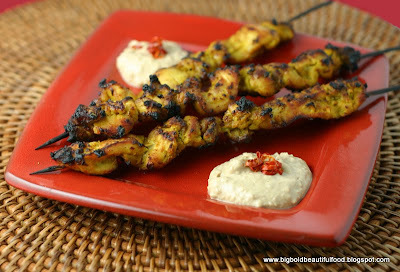 Your satays look fabulous! Yum =D. Very authentic. Like the satay I get here in Singapore. Well done on the challenge Ninette! I love the way you've chargrilled the chicken - I'm impressed that you just used a broiler! I'll have to try using my broiler next time when the weather turns pretty cold! I think that's great your broiler does such a good job! Mine is slightly drier than my grill, but it still does an ok job. And, wow, those really are some awesome pictures. ^_^ Everything looks very tasty and wonderful. that looks so yummy and well done! perfect Ninette!! Love your tips for cooking under the broiler. Great job on this challenge! great pictures! your satay looks juicy! Great tip to use broiler, hope to get more good tips from you.